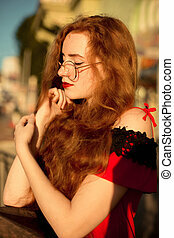 Wonderful blue eyed woman with long hair wearing pink dress posing in sun glare. 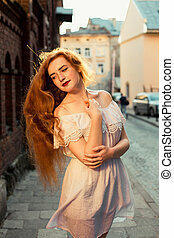 Wonderful blue eyed girl with long hair wearing pink dress posing in sun glare. 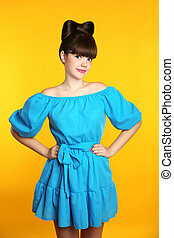 Beautiful girl with long wavy hair wearing in blue dress smiling and posing isolated on yellow studio background. Beautiful young woman with blue eyes wearing dress in the beach. Beautiful young woman with blue eyes wearing blue dress in the beach. beautiful young woman with hand in long hair wearing bright blue eyeliner and a matching dress with pearls. Young woman with dark long hair posing in pink dress.